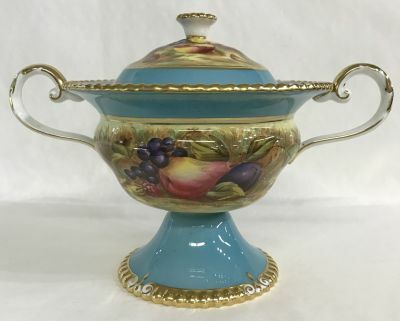 Aynsley two handled covered comport, in the fruit and berries pattern. With turquoise blue banding and gilded gadroon edge borders. English, circa 1950. Jones, Brunt and Bailey were the three main fruit painters at Aynsley. This piece is signed D. Jones and N. Brunt. Doris Jones was painting china at Aynsley 1938-69. Nancy Brunt was painting china at Aynsley 1935-75. 9 1/4” across the handles, 6 1/2” high.